Having sold our house we were on the move, rental truck to load the furniture, skip bin to discard unwanted items and the excitement of a new adventure ahead of us. As my mate Jamie wasn’t working at the time he came to help. After a long successful day we had packed the furniture, cleaned the house and filled the skip bin. Awesome. Time for a well earned refreshment. Whilst standing next to the skip bin, sipping on an ice cold beer, reflecting on our achievement, Jamie said something that changed my life. WOW, I was speechless. It made me think, not about what was in the skip bin, more importantly about what I had given up to get the things in the skip bin – time with my family, friends, myself – money that I could have invested or spent on more worthy endeavours. Have you ever thought about what is in your skip bin, what you have given up (time, money, relationships) to purchase things that you only end up throwing away. 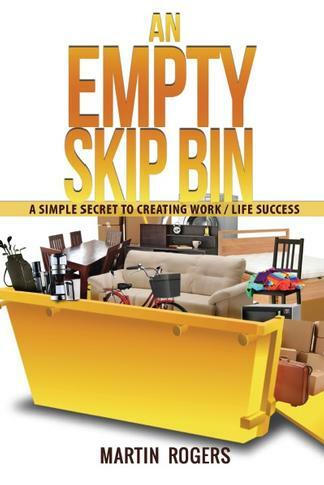 An Empty Skip Bin is a practical way to look at your life and reflect on how you use your time and money. To make the choices that will lead you to having a more fulfilling focused meaningful life, with a skip bin that is empty, or at least one that has fewer items in it. “It’s your time to Thrive not just Survive”. Be the first person to tell us what you think about An Empty Skip Bin and you'll save $5 on your next purchase!